Rtn. Dr. Chinnadurai Abdullah, Correspondent of the institution and the member of Syed Ammal Trust. Being a Radiologist, he has numerous ambitions to bring about landmark developments in the institution academically. He visits the premier institutions in the country and abroad and brings new ideas to create modem facilities in the campus. He involves himself in a lot of social activities. He has keen interest in sports and games. His encouragement and guidance made him the Vice-President of the various District Sports Associations. He is also holding the following honorary posts to his credit. 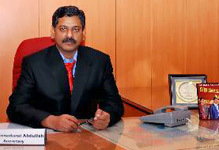 Former Vice President of Indian Radiological and Imaging Association – Tamilnadu and Pondicherry Chapter. Represented Madurai Kamaraj University Hockey Team in the year 1980. Holding various posts in various District Sports Associations. Patron of Dr. E. M. Abdullah memorial Blood Donor’s Club and donated blood more than 25 times.